On a rainy day in 1988, Bill Denbrough, a teenager in Derry, Maine with a sickly appearance and a pronounced stutter, makes a paper sailboat for his little brother Georgie (Jackson Robert Scott) who immediately takes it outside for a sail. As the boat sails down the street curb and heads for the sewer, Georgie runs to retrieve it. He arrives to find something unexpected… a clown… standing inside the storm drain. His name is Pennywise the Dancing Clown and his jaundiced eyes look lustfully on Georgie in a gut churning, almost unbearable moment of suspense. We know the child will likely be killed. (It’s the opening scene of a horror film after all), but the manner of death and the anticipated level of its intensity are in themselves the sources of our suspense. When the inevitable occurs, the brutality is shocking. Though not terribly gory by today’s standards, it’s cruel and disturbing because it plays on primal fears common to every parent – the fear of harm to a child. 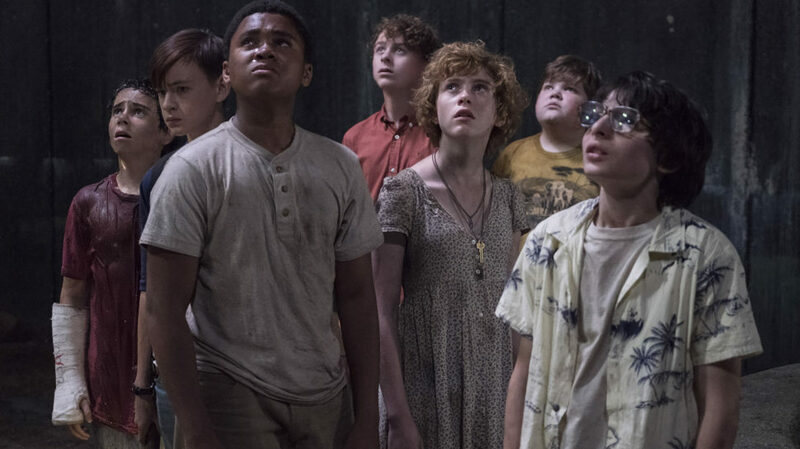 The idea of young children being killed in a horror film, or any film for that matter, was once considered taboo, but Muschietti gleefully offends. He wants to knock us out of our comfort zone and he succeeds. A year later, several other children in the town have seemingly vanished and Bill is still dealing with the loss of his brother. We soon meet six other teenagers, all misfits like Bill, and all haunted by their own demons. In a series of nightmarish, effects-fueled scare scenes, each of the seven face their own fears as Pennywise attempts to destroy them. Paintings come to life, bathroom fixtures spew blood, and Pennywise becomes more and more surreal as Muschietti ratchets up the delirium through each episode. Pennywise, we learn, is a supernatural incarnation of pure evil, who feeds on the children of Derry. Eventually the seven team up to find answers, leading them to an eerie showdown with the monster in the town’s underground sewers. This idea of a group of teenage protagonists solving crimes, investigating conspiracies, and dealing with anything more dramatic than putting on a show in their parent’s garage, has its roots in teen fiction like Nancy Drew and the Hardy Boys and became a movie staple in the 1980’s with Spielberg’s ET: The Extraterrestrial and other Spielberg produced films like Goonies and the film version of Stephen King’s Stand by Me. The concept continues today with the popular Netflix series Stranger Things, a sort of Goonies meets the X-files. King’s 1986 novel, on which this film and the original 1990 TV miniseries were based, is perhaps the ultimate expression of this idea. His teens were complicated and tortured, many of them victims of abuse and bullying. His Pennywise was a metaphor for the trials that teenagers face in the modern world. These scenes of bullying and abuse provide some of the most intense and frightening moments in Muschietti’s film. (Don’t bullies give wedgies anymore?) They cast a unsettling pall over the film that allows its more outlandish moments of horror to resonate more strongly. Still, thirty years later, King’s Loser’s Club misfits come off a bit more like stock troubled teens, worn out tropes that have suffered through years of imitation. There’s the chubby kid, a victim of violent bullies; the overprotected hypochondriac; the pressured rabbi’s son; the shy black kid, harassed by racists and haunted by a family tragedy; the spunky red-head, sexually abused by her father, and the bossy loudmouth. They all have that kind of Spielbergian rapport full of the kinds of things adults think kids say but with a staged coolness that doesn’t ring true. Though some of their dialogue is undeniable funny, these characters are a pretense. But we willingly suspend our disbelief for the sake of entertainment. And it’s easy enough to go along, partly because the seven young stars, including Finn Wolfhard, one of the young leads on Stranger Things, are well cast and likeable. Sophia Lillis as Beverly, the group’s only female, is especially memorable. As Pennywise. Bill Skarsgard is a living nightmare. A truly believable incarnation of evil, he’s both cartoonish and real-world evil. Treading a fine line between parody and the genuinely frightening, the expression on his face alternating between gleeful menace and utter depravity, he’s both horrifying and hilarious. Skarsgard may be extraordinary, but he’s the beneficiary of a director at the height of his powers. Muschietti, who directed the well regarded Spanish suspense thriller, Mama, maintains a giddy balance between tragedy, pure terror, and dark camp, between genuine scares and viciously ironic humor. His timing is flawless, and the film moves quickly through most of its 135-minute running time. Together with cinematographer Chung-hoon Chung’s wild camera angles, editor Jason Ballantine’s seamless cutting, a heart-pounding yet lovely score from composer Benjamin Wallfisch (Hidden Figures, Blade Runner 2049), and a brilliant visual effects team that brings every bizarre nightmare to ghoulishly beautiful life, Muschietti has crafted a masterpiece of audience manipulation. The thrills are calculated, but they’re executed with seemingly effortless precision to maximum effect. It is a creepy, chill-your-bones, poop-your-pants horror show that is clearly focused on its goals and delivers in no uncertain terms.